Self discipline is the single most important thing to achieve anything you want. Now we are going to talk about bad habits. To be successful, we all need to work hard, under deadlines and this creates stress. To overcome stress, we develop some bad habits. Like having something sweet. One of my friend is fond of dumplings made of cauliflower and chickpea flour, deep fried in oil. She is diabetic, have some extra weight and is advised by doctors to stay away from fried food. She is advised to reduce her weight but she cannot resist the craving while having stress. Eating this snack relieves her stress to some extent. Stress triggers her craving. This is just a small example how bad habits originates from triggers. It could be anything. 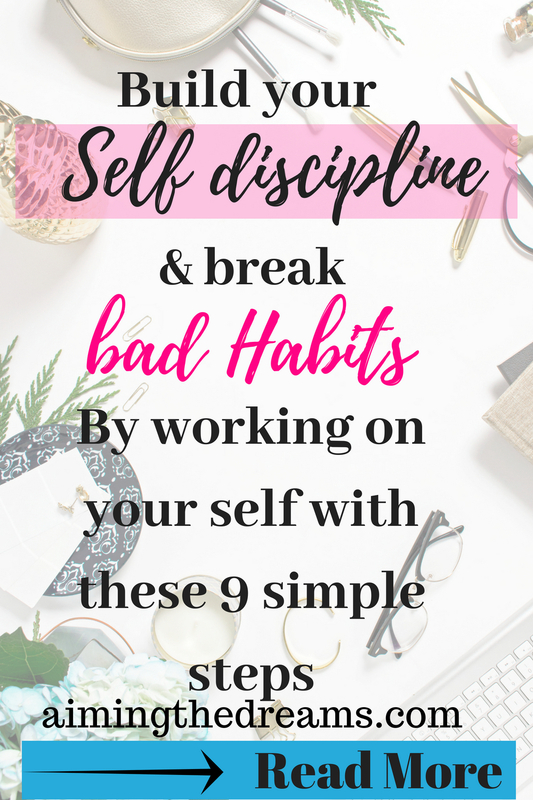 If you want to break those habits, you need to be determined to build self discipline. 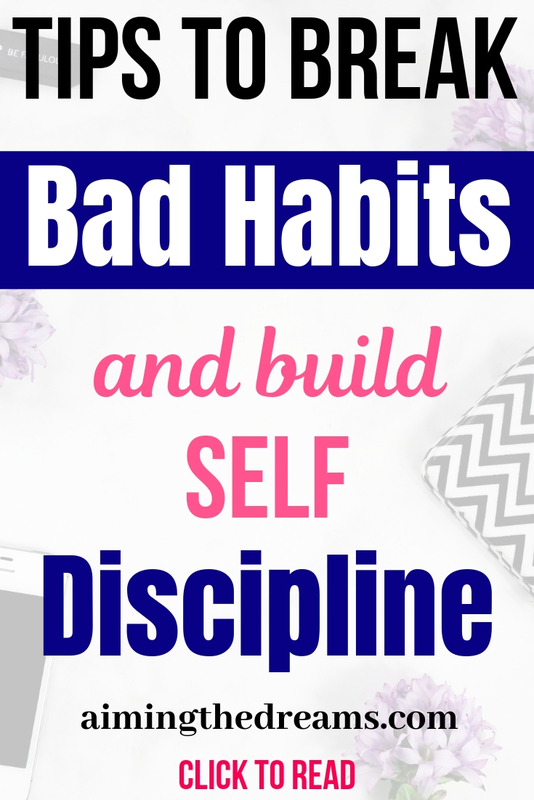 If you really want to build self discipline and break your bad habits, you need to realise that you have bad habits. Make a list of your bad habits. Just write down whatever comes to your mind. I had a very bad habit of reading a wrong way. I would start and read a a paragraph or some pages of a book, and then go to end. Then I would start reading backward which never made sense. I always wasted time in these things. Even with my syllabus books. I was fed up with myself. So I started paying attention to it, and whenever I had temptation of reading from back, I had to remind me of the time it will waste and come to the page where I was reading. Now I am better with my habit. Ask your true friends and they will definitely give you a list. Your friends know a lot about yourself. And they will give you a true picture of your self. Friends know your good as well as bad habits. And a true friend always tell you true things. Make a list what they tell you about you and analyse them. Write down the areas where you need to improve. Write down your habits the habits the way you want. Now comes the serious part of identifying the triggers. When you know the trigger, It becomes easy to figure out that your bad habit will come in your way. You can start doing something about that. As you have a list of bad habits, you can write triggers in front of it. Also make a third column for replacement of the bad habit. When you know the trigger and the remedy, you can act wisely as soon as you feel the urge of your bad habit. When you know your bad habits and the triggers, you will figure out what you need to do to break that habit. You will start having a plan consistent to the trigger. Some bad habits are easy to break and some are bit adamant. Calculate how much you will need to push yourself to change that habit. Start with what you feel is easy to break. Breaking one bad habit will always give you enthusiasm to break the toughest one. 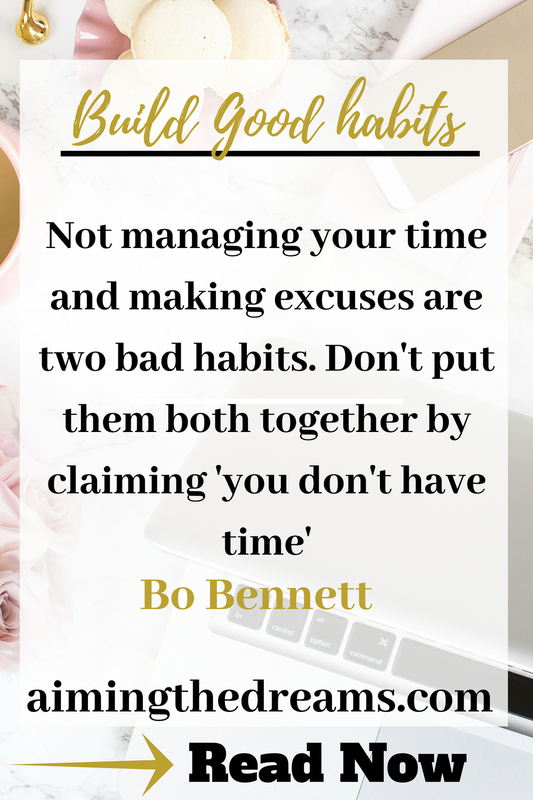 Bad habits takes your time from many important tasks and aspects of life. Try to think about what you can achieve by breaking that habit and having a new one. Write down it on a paper and put it where you can see easily. It could be anything like quitting smoking. Think how much your health will improve and write down the amount of money you will save. I have a friend who told me once that while she was trying to quit smoking, she would think of money going in smoke of the cigarette. This thought started giving her uneasiness. She just regretted it every time. First she reduced the amount of cigarettes and then quit completely. Now she saves all the money she wasted in smoking and have good bank balance from that money. Now make a list of good habits you want to have. Print this and put this list near your bed so that you can have a look while going to sleep and while waking up. As our subconscious remember those things which we tell it daily. Also make a picture of it. Our subconscious remember everything by creating images. If you can keep picture of good habits you need to develop, it will help you in acquiring habits easily. Gradually you will start acting that way. Your bad habits will be replaced by good habits. 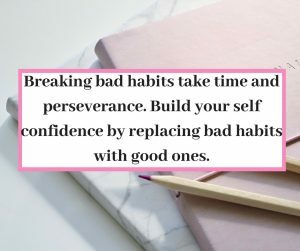 As you know that bad habits are a way to hinder your growth, be very specific about your goal and why you want to accomplish that. Think about the rewards you will get if you will stay focused on your Why. And make a plan for keeping your self on the track. Also make a plan to combat the triggers of bad habits. For example, if you want to loose some weight, but you cannot resist the temptation of your french fries. Always have a picture of your self on your phone as you look now and a picture of how you would look like when you have lost some weight. You can photo-shop your picture with little changes. As soon as you get that craving of french fries, have a look at the picture you want to be. And think about how much more you have to wait to get that. Here you will build a self discipline gradually. When you get to know about your bad habits, you start stressing about them. Don’t over think instead start paying attention to what kind of habits you want to have. Visualise yourself with those habits. If you want to save money and be wealthy, don’t think of spending money on expensive clothes and expensive travel destinations. Rather start visualising yourself having money in your bank account or investment and lying on bed happily. 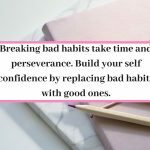 Believe me, these things change our thinking pattern and so the triggers for bad habits.It will be difficult in the beginning, but as you will grow, breaking a bad habit will become easy. Stress often triggers bad habits. Don’t push yourself and don’t stress. Go slow on yourself. Because little changes daily makes big difference at the end of the year. Please share this post, if you like it. I will be thankful for this from bottom of my heart.